Coenzyme Q10 or CoQ10 is readily available in meats, beef liver, chicken, and seafood. Vegetarian sources like avocado, nuts, seeds, cauliflower, and broccoli are other ways to get this coenzyme that plays a key role in metabolism. Some of these foods will give you 3 mg or more of CoQ10 per serving! Coenzyme Q10 or CoQ10 is a coenzyme that is central to energy production and many metabolic processes in our body. Couple that with its antioxidant powers which have myriad health benefits and you are justified in trying to ensure you get adequate levels of foods containing this nutrient too. Here’s a more detailed roundup of its benefits and dietary sources of the nutrient you can count on. CoQ10 is something your body needs for a lot of its vital energy-dependent functions, including that of the heart – for instance, the contraction of your heart muscles. Quite simply, if you need to convert the food and nutrients you consume into energy that can be used by the body, you need adequate CoQ10 in the system. Based on data extrapolated from animal studies, a daily intake of 12mg/kg/day of CoQ10 should be ok to have.3 This means, when taken as a supplement, doses vary from 90 mg to 200 mg on average. The coenzyme has low toxicity and should not cause any major side effects when taken in supplemental form.4 However, while you do have the option to take it as a dietary supplement, some foods already contain this coenzyme too. As you’ll see from this list, they’re quite readily available ingredients you are more than familiar with. 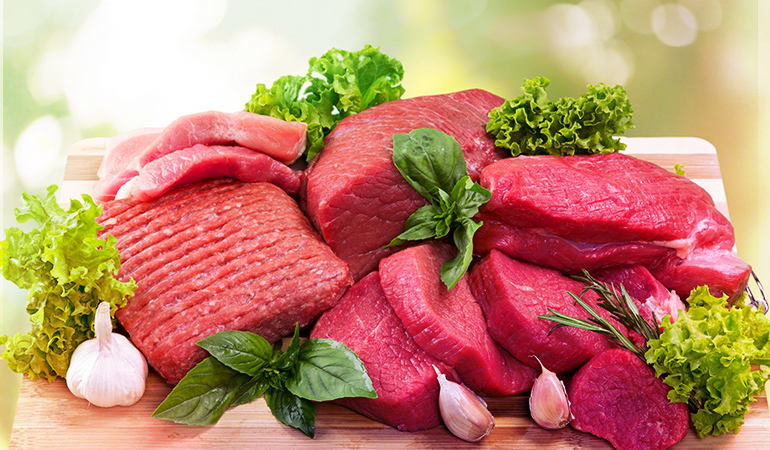 If you enjoy beef or pork, these muscle meats contain 13.8–192 mcg/gm of the coenzyme.5 With a typical 3 oz serving that means 1.173 mg to 16.32 mg. Cook these meats the way you like them best, grilled, roasted, or even pan-fried to sizzling caramelized crusty perfection before finishing off in the oven. Eat them with your favorite sides. You could also boost CoQ10 further with a stir-fried broccoli or cauliflower rice side. 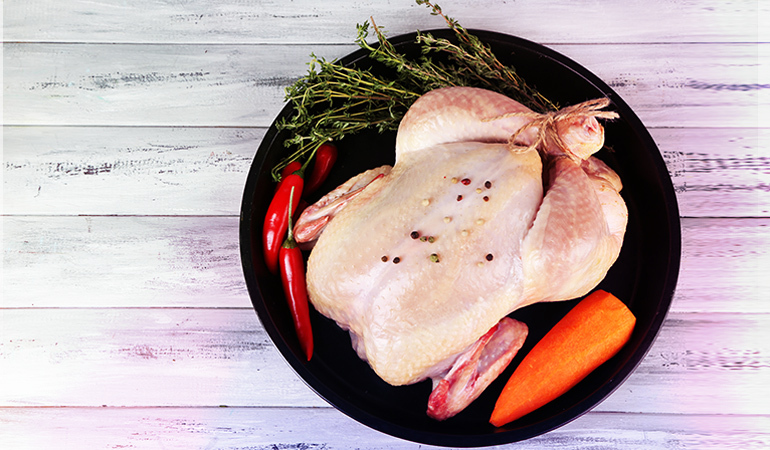 If you find chicken a failsafe option for lean protein, there’s good news for you too! Chicken breast meat contains between 7.8–17.1 mg/kg of CoQ10. So if you’re eating a standard 3 oz serving, you’ll probably consume between 0.66–1.45 mg of CoQ10.7 Roast some chicken and enjoy the succulent meat with a delicious gravy and trims, or shred it to make a pulled chicken sandwich or to oomph up a salad. If you’re up for something that’s exciting for your palate, a middle eastern marinade can transform the humble chicken into the most delectable kebabs. You could also make a comforting chicken soup with chicken pieces added in – Vietnamese pho goes down well with most. 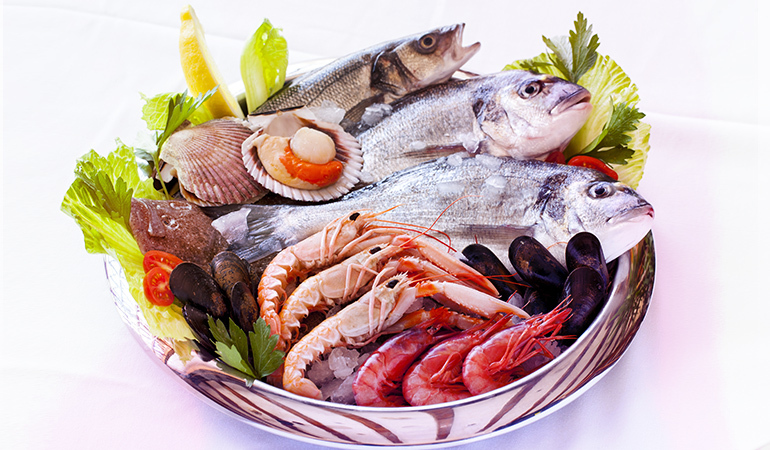 Fish and shellfish contain 1.25–130 mcg/gm of CoQ10.8 That’s 0.11 mg to 11.05 mg per 3 oz serving of fish. Use them grilled simply with lemon and herbs or get a mix of your favorite seafood to make a fisherman’s stew. You can also experiment with Japanese sauces or Chinese spices to cook up a heavenly meal. 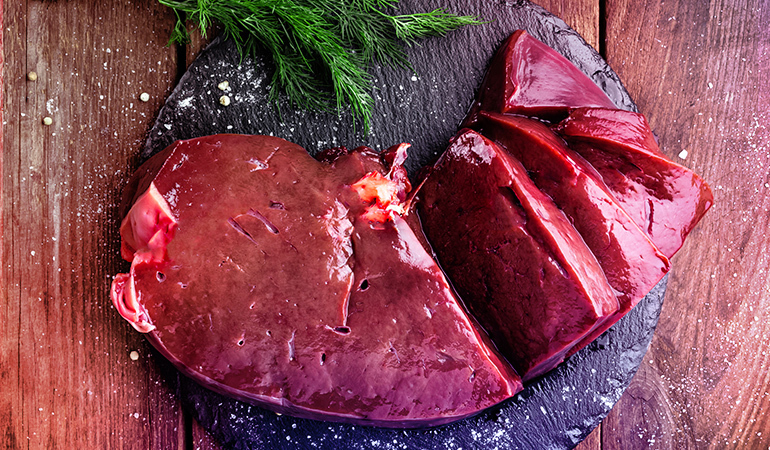 Beef liver is a great source of CoQ10. It has between 39.2–50.5 mg/kg of the coenzyme, which translates to 1.1–1.43 mg of CoQ10 per 1 oz serving.10 You can braise the beef liver or saute it off in a pan after dusting the meat with some flour. Use onions, sage, salt, pepper and other herbs and spices to whip up a lip-smackingly good meal. It also works well with mushrooms or a red wine sauce. Or make a spicy liver curry if you dare! 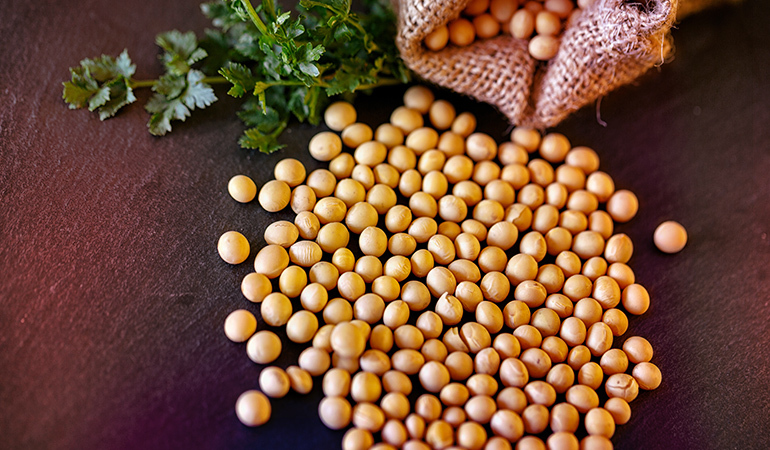 Boiled soybeans have 12.1 mg/kg of CoQ10. A cup of the boiled beans (about 172 gm) should deliver 2.1 mg of CoQ10.11 Soybeans taste great in Southern recipes with rice, just like they do in Asian style recipes. You can also try making falafels or burgers with them. 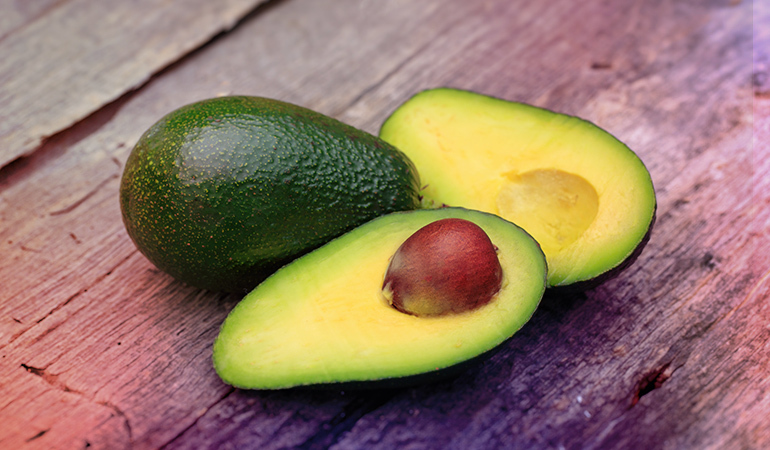 An avocado has 9.5 mg/kg of CoQ10 on average. So if you have a cup (150 gm) of the chopped fruit, you stand to get 1.43 mg of the coenzyme.13 Avocados taste great on toast but you can also enjoy Mexican food like tacos and enchiladas with your own batch of fresh guacamole. Add it to salads to make them more filling and healthy. Avocados are even used in baking and chocolate puddings, so why not give that a go too? 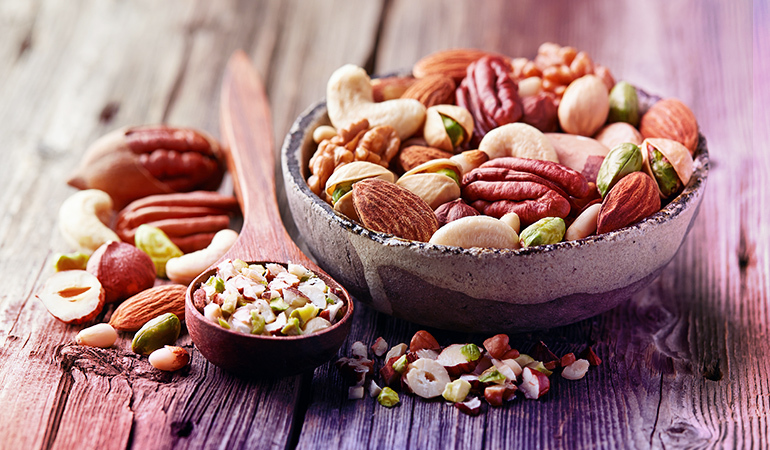 Nuts and seeds hardly take any effort to include in your diet. Nibble on the roasted nuts and seeds as a snack, sprinkle them onto your breakfast cereal or yogurt, make them into healthy homemade granola bars, or add them to your home baking in muffins, bread, and cakes. 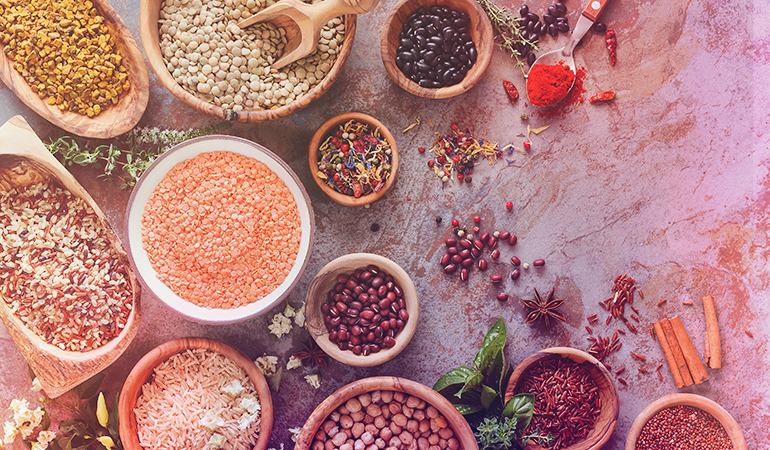 Pulses have between 2.31–6.82 mcg/gm of CoQ10, making them an alternative that vegans can enjoy.16 A cup of cooked lentils runs to about 198 gm to the cup full. So you’d consume as much as 0.46–1.35 mg in that serving size. Lentils are filling and can be a fabulous one-dish meal. Toss them in a pot with some vegetables, herbs, and spices and slow cook them to heart-warming perfection. Or experiment with an Indian recipe for daal made with healing turmeric, curry leaves, ginger, and a tempering of mustard seeds. You could even try whipping up a pasta with mushrooms, herbs, and lentils! Of course, there’s always the old staple of lentil soup if that’s something you enjoy. 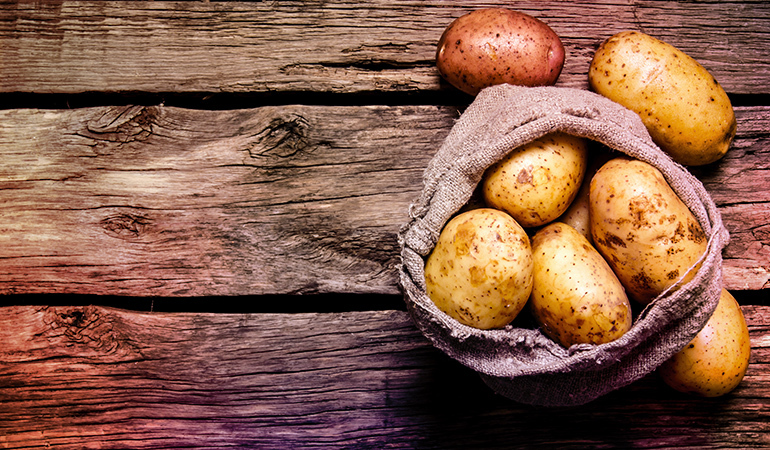 Potatoes contain, on average, anywhere from 1.05–3.01 mcg/gm of CoQ10.17 A cup of boiled potatoes runs to about 156 gm, so you’d be consuming 0.16–0.47 mg per serving. Fashion them into crunchy croquettes, add finely diced peppers or some sweet potatoes and spices to them for an amped-up mashed potato recipe. Or just have your potatoes in a creamy yogurt dressing as a salad. With potatoes, it is hard to go wrong! There is 5.2 mg/kg of CoQ10 in the yolk of an egg. 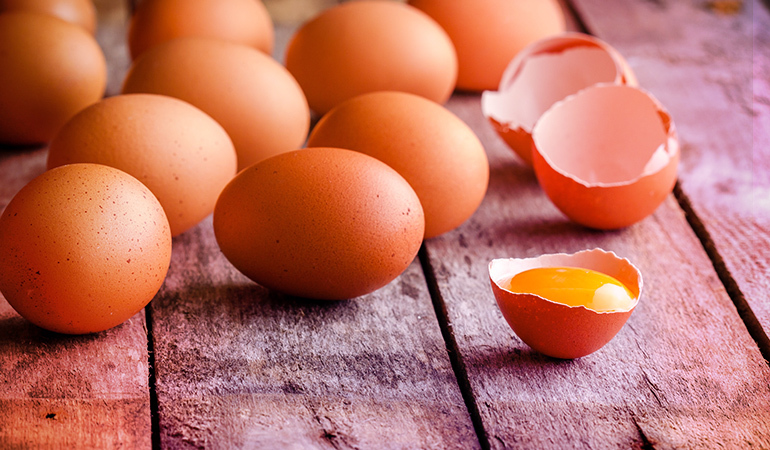 Given that an average egg yolk from a large egg weighs about 17 gm, that means you’ll get about 0.09 mg per yolk you have. Eat a full egg, whites and all and that number could vary between 0.7–3.7 mg/kg, which means a large egg (about 50 gm) has between 0.04–0.19 mg per egg.18 Enjoy eggs baked with spinach, or bell peppers and tomato, or even a savory olive tapenade. Or just fry them up or scramble them for a quick-fix breakfast. Alternatively, you could use the eggs to make an egg salad or a Sri Lankan or Indian style egg curry. 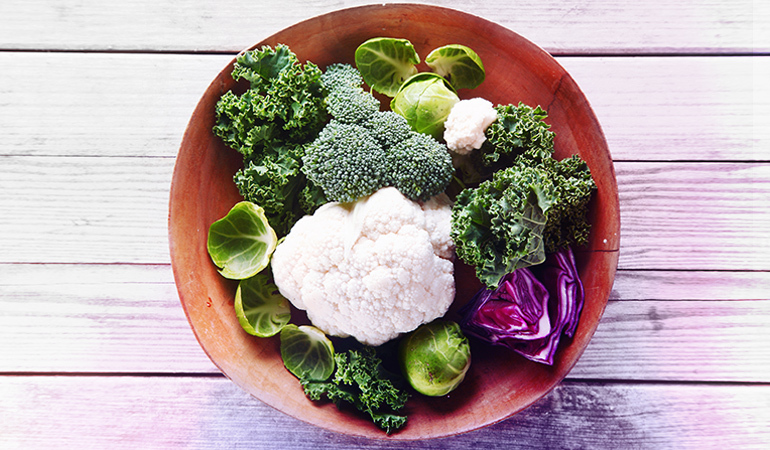 Cruciferous vegetables broccoli and cauliflower also give you CoQ10. These veggies are delicious just simply grilled, baked, or lightly sauteed. If you’re trying to be even healthier, lightly steam them and use them in salads. With this list of some of the best sources of CoQ10, you’re unlikely to run out of ways to get this coenzyme into your meal plans. So go ahead and plan that weekly menu! 1. ↑ Kumar, Adarsh, Harharpreet Kaur, Pushpa Devi, and Varun Mohan. “Role of coenzyme Q10 (CoQ10) in cardiac disease, hypertension, and Meniere-like syndrome.” Pharmacology & Therapeutics 124, no. 3 (2009): 259-268. 2. ↑ Cleren, Carine, Lichuan Yang, Beverly Lorenzo, Noel Y. Calingasan, Andrew Schomer, Anthony Sireci, Elizabeth J. Wille, and M. Flint Beal. “Therapeutic effects of coenzyme Q10 (CoQ10) and reduced CoQ10 in the MPTP model of Parkinsonism.” Journal of neurochemistry 104, no. 6 (2008): 1613-1621. 3, 4. ↑ Hidaka, Takayoshi, Kenji Fujii, Iwao Funahashi, Naoki Fukutomi, and Kazunori Hosoe. “Safety assessment of coenzyme Q10 (CoQ10).” Biofactors 32, no. 1‐4 (2008): 199-208. 6, 7, 9, 10, 11, 12, 13, 14, 15, 18, 19. ↑ Pravst, Igor, Katja Žmitek, and Janko Žmitek. “Coenzyme Q10 contents in foods and fortification strategies.” Critical reviews in food science and nutrition 50, no. 4 (2010): 269-280.